Andrew Jackson (March 15, 1767 – June 8, 1845) was a General in the War of 1812 and was considered to be a war hero. He became the seventh President of the United States of America. He was the first Democrat and is on the Twenty Dollar Bill. His nickname was "Old Hickory". As a boy Andrew Jackson was a messenger for the Continental Army. The British caught him and mistreated him. He was the first U.S. President who was not born into a rich family. He was not a rich man and did not have a college education. For these reasons, Jackson stood for the common man (people who worked hard and did not make a lot of money, like farmers). In 1791, he fell in love with Rachel Donelson Robards. They went through a marriage ceremony. However, the marriage was not legal because she had not been granted a divorce from her first husband. Therefore, they married legally three years later. They had no children, but they adopted several. He became rich and owned a large plantation. Andrew Jackson reorganized the Democratic Party and was its leader. In 1828, he defeated John Quincy Adams in the Presidential Election of 1828, he became President on March 4th, 1829, and four years later he was re-elected to a second term as President. Jackson supported a popular democracy where the people directly elect the President instead of what we have now, the Electoral College where the people elect people who elect the President. During his Presidency, he signed the Indian Removal Act which allowed the U.S. government to violently force the Native Americans to move from their land and go west. Many Native Americans were killed and the path they walked to get to the west was called the Trail of Tears. 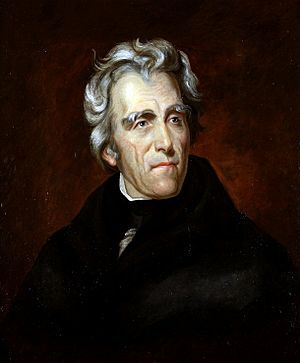 Andrew Jackson was against the national bank of the United States because he felt that it was run by rich powerful people and that it did not serve the interests of the common man. The national bank expired during Jackson's Presidency. Jackson chose not to continue the bank. On March 4th, 1837, Andrew Jackson finished his second term. After that, Vice-President Martin Van Buren became President (because he was elected) and continued many of the things Jackson did. Jackson was a big influence on other Democrats during the 1800s. Jackson's legacy among historians is mixed. On one hand, Jackson became a rich man and owned many slaves. He had many Native Americans killed or kicked out of their homes. Most people now disagree with him and believe that a national bank is necessary for a country to do well. On the other hand, Jackson was a successful General in war and led a powerful political movement in peacetime. He stood for the common man, and changed the country. 1833 Democratic cartoon shows Jackson destroying the Devil's bank. Andrew Jackson Facts for Kids. Kiddle Encyclopedia.